This route is known in German as "Bike Crossing Schwarzwald". It runs from Pforzheim to Bad Säckingen and is 445km (278 miles) long with 16200m (58500') height difference. Technically it appears not be that difficult as much of the route is along forest roads that are at least 2m wide. There is, however, the odd stretch of single track to give the route some pep. Cycling the route will probably take seven to ten days. It is like crossing the Alps so you need to cut down on your gear to get it into a six to seven kilo rucksack. 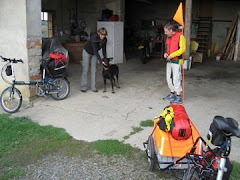 The route has the advantage over the Alpine crossings that cycle from village to village and so you can wash your stuff in the evenings as well as stocking up on victuals every day. The Black Forest tourist organisation (service@schwarzwald-tourismus.info) will book hotels and organise baggage transfer in case you feel that pajamas are an essential you cannot do without. There is some information under http://www.blackforest-tourism.com/discovery/sports/Bike-Crossing-Schwarzwald.